LARGO, Md. — SSUNAA Washington DC Chapter President Zelmar Gordon presents a scholarship donation on behalf of the chapter to Dr. Cheryl Davenport Dozier, President of Savannah State University. LARGO, Md. 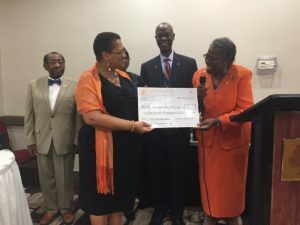 — Members of the Savannah State University National Alumni Association Washington, DC Chapter marked the chapter’s 60th anniversary with a celebration banquet on October 13. During the event, the chapter honored James O. Thomas, Jr., Raymond Knight, and William N. Weston who were all original founders of the chapter in 1967 and Eloise Alston, an honorary chapter founder. The keynote speaker was Jimmie Jackson, a former national president of the SSUNAA and the Savannah State University Foundation. The chapter also presented a special scholarship presentation to Cheryl Davenport-Dozier, the 13th president of Savannah State University. 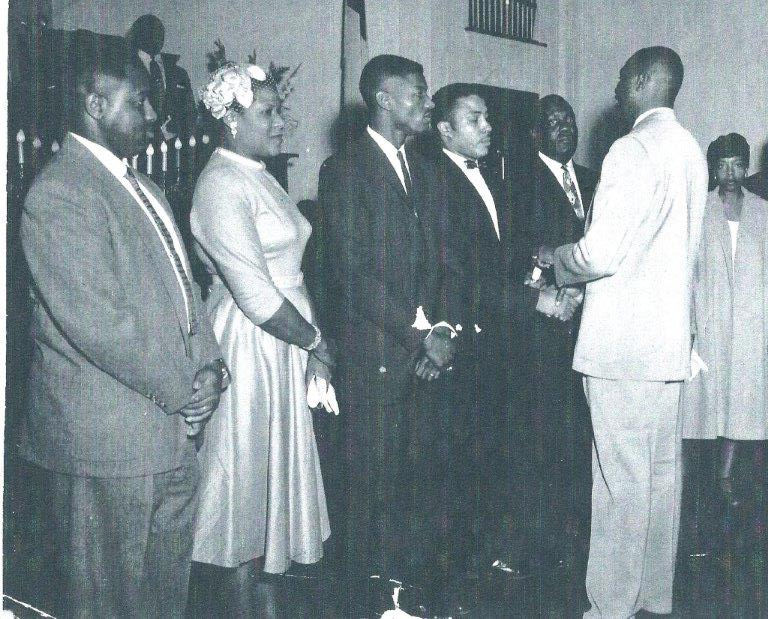 WASHINGTON — Members of the SSUNAA Washington DC Chapter during the chapter’s installation of officers ceremony in 1957. Photo provided by W. Robinson from the SSUNAA Washington DC Chapter archives. 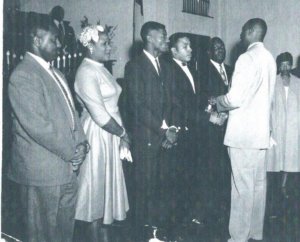 The SSUNAA Washington, DC Chapter was officially established on November 10, 1957 and was the first SSUNAA chapter organized outside of the state of Georgia. The chapter currently serves the Savannah State University community in Washington, DC, northern Virginia, and southern Maryland and participates in a variety of support, networking, athletic, and family-friendly events and activities throughout the year. For additional information and to see photos from the event, visit the chapter’s website at dcchapter.ssunaa.org. SAVANNAH, Ga. — On Sunday, February 12, the SSUNAA national president, Clyde A. Newton, presented a $10,000 check to Dr. Cheryl Dozier, the president of Savannah State University, during the SSU Day program at Connor’s Temple Baptist Church of Savannah. 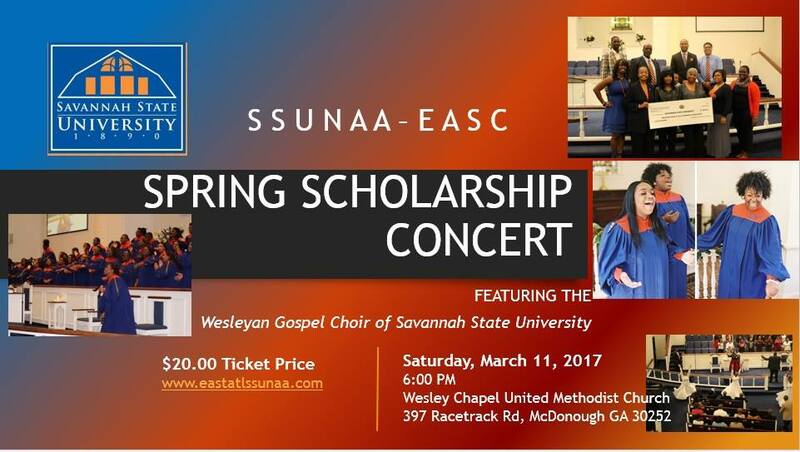 The SSU Day program is a special worship service hosted annually by the church. Newton was the keynote speaker for the event. The $10,000 donation represented funds collected from alumni and supporters during the first half of the fiscal year. The funds have been designated to provide support in several areas including scholarship, athletes summer school, the SSU President’s Gala, and the SSU Penny Fund account. The members of Connors Temple Baptist Church also made a donation to the university. The Chairperson for the event was SSU alumna Virgnia Parham and other members of the committee included SSU alums Bernard Conyers and Alfred Brown. Reverend Terrence Burrell is the pastor. During the conference, a series of workshops provided a mechanism to enlighten alumni on critical issues at the universities. Art Dunning, the president of Albany State University, conducted an information session outlining the consolidation of Albany State and Darton College. The University President’s Roundtable session was designed to offer the alumni in attendance a direct, focused and specific issues relating to each university. In the conference wrap up session, Gregory Hylick, former National Alumni President of Albany State University and Chairman of the Albany State University Foundation, Inc., assumed the role as Executive Committee Chair of the GAAHBSU. Hylick was elected in 2016 to replace longtime chairman Roy L. Jackson, the former National President of the SSUNAA. Alumni attending the conference were also afforded the opportunity to engage with state legislator during a visit to the State Capitol. During the weekend, the GAAHBSU continued its longstanding effort to recruit students from the Atlanta area to attend the universities. Students and recruitment teams from each university participated in recruitment fairs in 10 Atlanta area high schools. 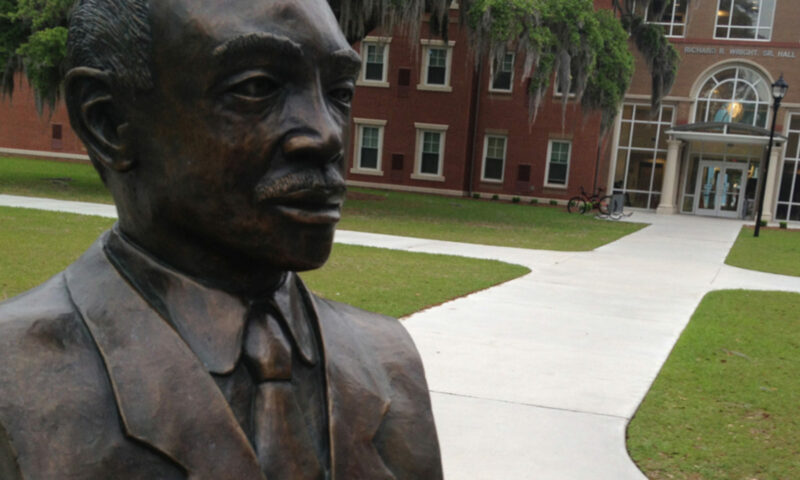 The GAAHBSU, a collaboration effort between the state’s three historically Black universities, was created 32 years ago to foster a collective effort to ensure the continued existence, growth and advancement of these three unique higher education institutions. The Fort Valley State National Alumni Association served as the host for the 2017 GAAHBSU Conference. 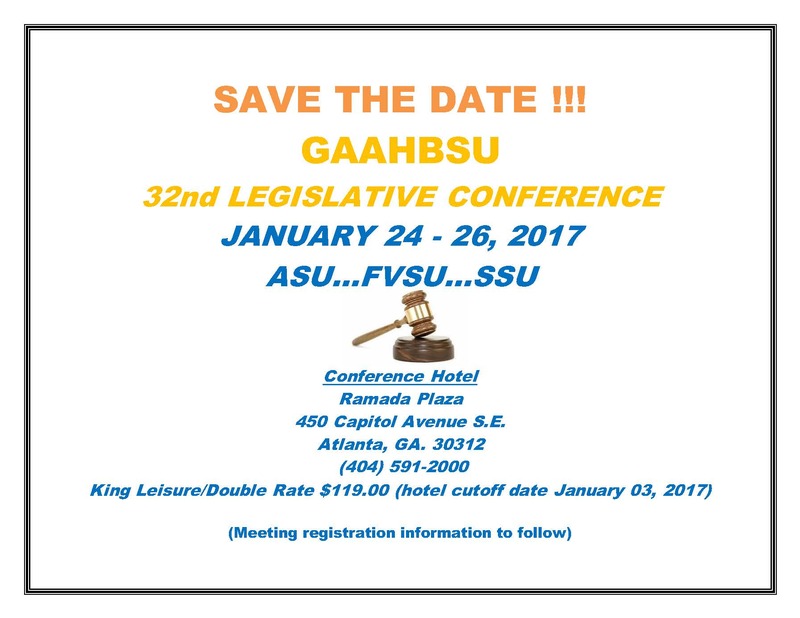 FORT VALLEY, Ga. — The 32nd Annual GAAHBSU (Georgia Alumni Association of Historically Black State Universities) Legislative Conference will be held on January 24 – 26, 2017, at the Ramada Plaza Atlanta Capital Park Hotel (Downtown Atlanta). The registration fee for the conference is $130. You can download the registration form now at ssunaa.org/documents/GAABSU_brochure_2017.pdf. Fort Valley State University National Alumni Association, Inc. is the host Association for GAAHBSU 2017. The theme for this year’s conference is “Envisioning Our Future, Embracing Our Legacy, and Expanding our Horizon”. GAAHBSU is a consortium of the National Alumni Associations of Albany State University, Fort Valley State University, and Savannah State University. It is organized to advance their missions and to help ensure the futures of these historically significant institutions. The legislative conference provides a forum for alumni and officials of Georgia’s Historically Black Public Universities to dialogue with elected officials and key state leaders to address the universities’ common goals and concerns.